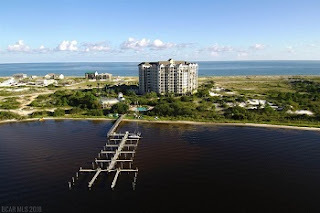 Perdido Key waterfront condo for sale in Perdido Key FL. This 4BR/3BA Florencia east corner unit has incredible views of Ole River and the Gulf of Mexico. This units open floor plan is the perfect setup for entertaining. Once you enter the unit your eyes are immediately drawn across the room to the view provided by the wall of glass sliders that open to the balcony. The kitchen has both a center island as well as a large island with a double sink and breakfast bar area. There is tons of storage and cabinets space along with granite countertops throughout. The wide open living room opens up to a unique dining area with a wall of windows that provide an expansive view of Ole River and the grounds of Florencia. Flooring throughout the Kitchen, Living and Dining area is oversized Porcelain Tiles. The Master Suite is complete with incredible views of the Gulf and Ole River. Combine that with a spacious Master Bath with separate Jetted Garden Tub and Large Double Headed Stand up Shower and small Gulf View Balcony.….there’s more, come see this condominium home!